Philippa Charlotte “Pippa” Middleton, the 33-year-old little sister of Kate Middleton, wed millionaire hedge fund manager James Matthews in Englefield, England on Saturday. 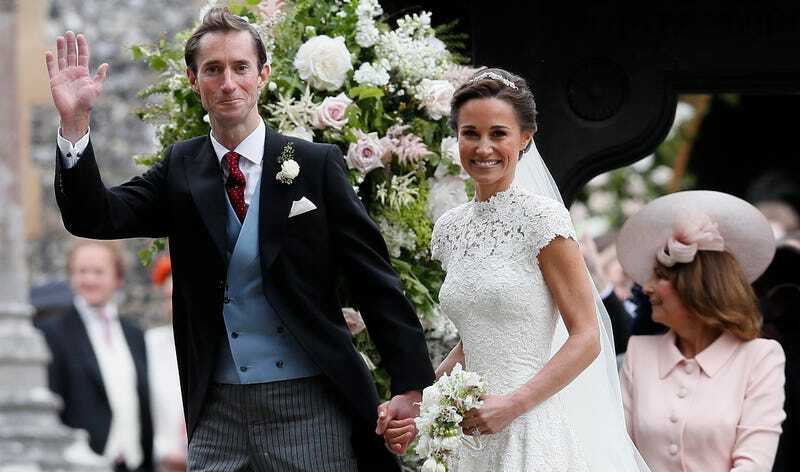 Pippa wore a custom Giles Deacon dress and a Stephen Jones veil embroidered with pearls. It rained just before the ceremony, and, according to The Daily Mail, the wedding was Scottish-themed, perhaps because Pippa attended Edinburgh University. The guests reportedly dined on haggis canapés and the whiskey required to stomach them. Prince Harry arrived solo, though several outlets have speculated that his girlfriend, Meghan Markle, was expected to join him at the reception. Roger Federer and his wife Mirka were also there. And here’s the Duchess of Cambridge with flower boys and girls. Earlier this week, Public Policy Polling found that The Rock has high favorables among both Democrats and Republicans as a presidential candidate, although about half of all voters have no opinion about him whatsoever. Still, there’s plenty of time to change that. Johnson also told Fallon that he thought voters were looking for “more poise, less noise,” and “better leadership.” He believes his mass appeal comes from a combination of early rising, supporting the troops, and being a family man.